At the begining, it was the Equipement Minier (E.M.) who sell the Limberoller® develooped by JOY, then EM. become SECOMA, of course manufacturing quality is similar but references are changed. Also note that SECOMA has been transfered to LOR TP then to S.A.E.F. (there are the name you can read on the hook of the flexible iddlers). 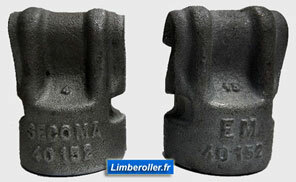 The reference on the hooks are the same since Equipement Minier, they do not allow, they do not make it possible to know the wight of the belt but with this you can know if you have original Limberoller® or not (for more information about copy : click here).